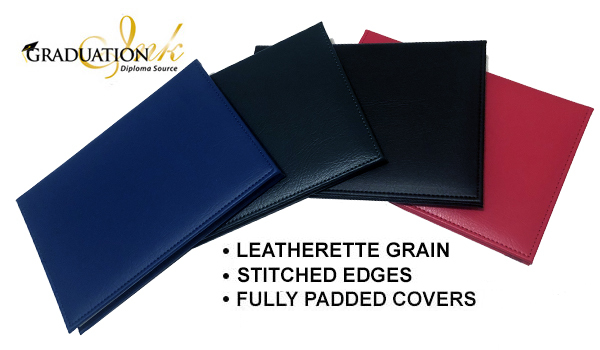 The attractive Series 500 royal blue diploma cover is constructed of a stiff cardboard frame, lightly padded, and covered in a durable, turned edge, leatherette material. The diploma/certificate cover opens with the spine on the long side and has a classy white moire finish on the inside. When opened, the lower half of the cover has four white, silk corners to secure the custom designed 5 1/2" x 8 1/2" Series 500 diploma sheets. When closed, this cover will measure approximately 5 3/4" x 8 3/4". Acetate sheet protectors are included. The Series 500 royal blue diploma cover is also available in three other colors. This royal blue diploma cover can also include lettered foiling on the front or a custom foiled logo or mascot. Lettering can be a maximum of two lines and costs $1.25 per line on each diploma. To custom foil of a logo or school mascot into the cover, please contact us for detailed pricing information.